Aaron Hernandez Suicide Notes Revealed In New Book - Pop It Records - NEW MUSIC EVERYDAY! Aaron Hernandez left behind three suicide notes before he hung himself in his jail cell in April of 2017, including ones to his daughter, Avielle Jenkins-Hernandez, fiancée Shayanna Jenkins and lawyer, Jose Baez. In a new book by Hernandez's attorney titled, "Unnecessary Roughness: Inside the Trial and Final Days of Aaron Hernandez," Jose Baez reveals what was in those three suicide letters that were found in his jail cell, as well as some details about Hernandez' affairs - including one with another man. Hernandez, who was serving a life sentence for the murder of his friend Odin Lloyd, was found naked hanging from a bed sheet with "John: 316" written on his forehead, according to state officials. 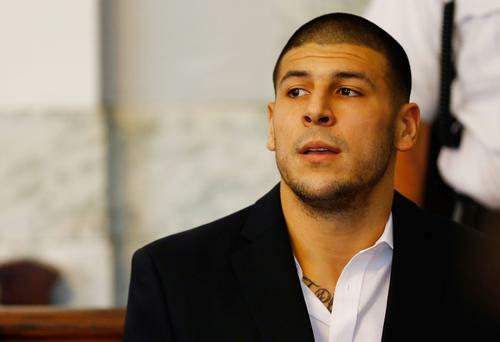 The suicide came just days after Hernandez was acquitted of two murder charges related to a July 2012 drive-by shooting outside a Boston nightclub. "I need a favor -- If you have any contacts for any artists like Gates, Meek Mill, Ross, Jay, Game ... etc. I would like to send you letters so you can send to their information or whichever way you think best. I don't want any media really getting into me, trying to just send my love to all the artists who got me through my tough times and sending my respect to a few of the real ones out there. So I think that's the best idea through you. It's something I have to do and I'd appreciate if you could do that for me, if possible! If not, I'll figure something out. Well, get at me, love ya brother!" Additionally, Baez alleges that Hernandez admitted to having an affair with another man, claiming that in the final days of his double murder trial prosecutors were planning to question his fiancee Shayanna Jenkins about his affairs - one with a woman and one with another man. Hernandez allegedly burst into tears, according to Baez, afraid of how Jenkins would react to his affair with a man who also happened to be a mutual friend of theirs. 'But Jose, she'll be devastated. I never meant to hurt her. I know I keep disappointing her. But she is my soul,' Hernandez told Baez. In the new book, Jenkins also addresses that report, "I saw no indication that he was gay or homosexual. I wish I had known how he felt, just so we could have talked about it. I wouldn’t have disowned him. I would have been supportive. I can’t fault him if he was feeling that way."